Next morning the not-yet-subsided sea rolled in long slow billows of mighty bulk, and striving in the Pequod's gurgling track, pushed her on like giants' palms outspread. The strong unstaggering breeze abounded so, that sky and air seemed vast outbellying sails; the whole world boomed before the wind. Muffled in the full morning light, the invisible sun was only known by the spread intensity of his place; where his bayonet rays moved on in stacks. Emblazonings, as of crowned Babylonian kings and queens, reigned over everything. The sea was as a crucible of molten gold, that bubblingly leaps with light and heat. Long maintaining an enchanted silence, Ahab stood apart; and every time the teetering ship loweringly pitched down her bowsprit, he turned to eye the bright sun's rays produced ahead; and when she profoundly settled by the stern, he turned behind, and saw the sun's rearward place, and how the same yellow rays were blending with his undeviating wake. Thrusting his head half-way into the binnacle, Ahab caught one glimpse of the compasses; his uplifted arm slowly fell; for a moment he almost seemed to stagger. Standing behind him Starbuck looked, and lo! the two compasses pointed East, and the Pequod was as infallibly going West. But ere the first wild alarm could get out abroad among the crew, the old man with a rigid laugh exclaimed, "I have it! It has happened before. Mr. Starbuck, last night's thunder turned our compasses- that's all. Thou hast before now heard of such a thing, I take it." Here, it must needs be said, that accidents like this have in more than one case occurred to ships in violent storms. The magnetic energy, as developed in the mariner's needle, is, as all know, essentially one with the electricity beheld in heaven; hence it is not to be much marvelled at, that such things should be. Instances where the lightning has actually struck the vessel, so as to smite down some of the spars and rigging, the effect upon the needle has at times been still more fatal; all its loathsome virtue being annihilated, so that the before magnetic steel was of no more use than an old wife's knitting needle. But in either case, the needle never again, of itself, recovers the original virtue thus marred or lost; and if the binnacle compasses be affected, the same fate reaches all the others that may be in the ship; even were the lowermost one inserted into the kelson. Meanwhile, whatever were his own secret thoughts, Starbuck said nothing, but quietly he issued all requisite orders; while Stubb and Flask- who in some small degree seemed then to be sharing his feelings- likewise unmurmuringly acquiesced. 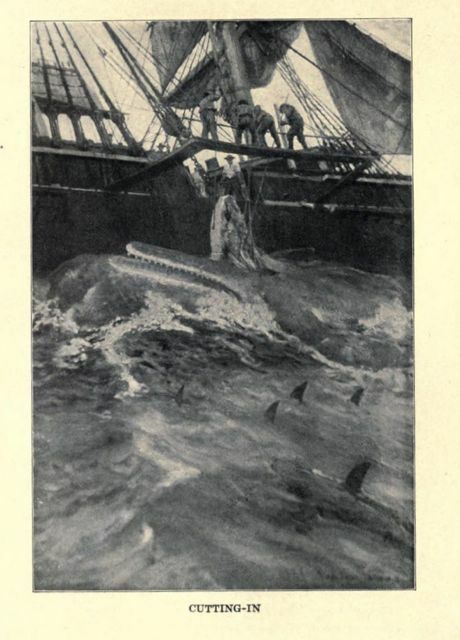 As for the men, though some of them lowly rumbled, their fear of Ahab was greater than their fear of Fate. But as ever before, the pagan harpooneers remained almost wholly unimpressed; or if impressed, it was only with a certain magnetism shot into their congenial hearts from inflexible Ahab's. "Thou poor, proud heaven-gazer and sun's pilot! yesterday I wrecked thee, and to-day the compasses would fain have wrecked me. So, so. But Ahab is lord over the level loadstone yet. Mr. Starbuck- a lance without the pole; a top-maul, and the smallest of the sail-maker's needles. Quick!" With a blow from the top-maul Ahab knocked off the steel head of the lance, and then handing to the mate the long iron rod remaining, bade him hold it upright, without its touching the deck. Then, with the maul, after repeatedly smiting the upper end of this iron rod, he placed the blunted needle endwise on the top of it, and less strongly hammered that, several times, the mate still holding the rod as before. Then going through some small strange motions with it- whether indispensable to the magnetizing of the steel, or merely intended to augment the awe of the crew, is uncertain- he called for linen thread; and moving to the binnacle, slipped out the two reversed needles there, and horizontally suspended the sail-needle by its middle, over one of the compass cards. At first, the steel went round and round, quivering and vibrating at either end; but at last it settled to its place, when Ahab, who had been intently watching for this result, stepped frankly back from the binnacle, and pointing his stretched arm towards it, exclaimed,- "Look ye, for yourselves, if Ahab be not lord of the level loadstone! The sun is East, and that compass swears it!"